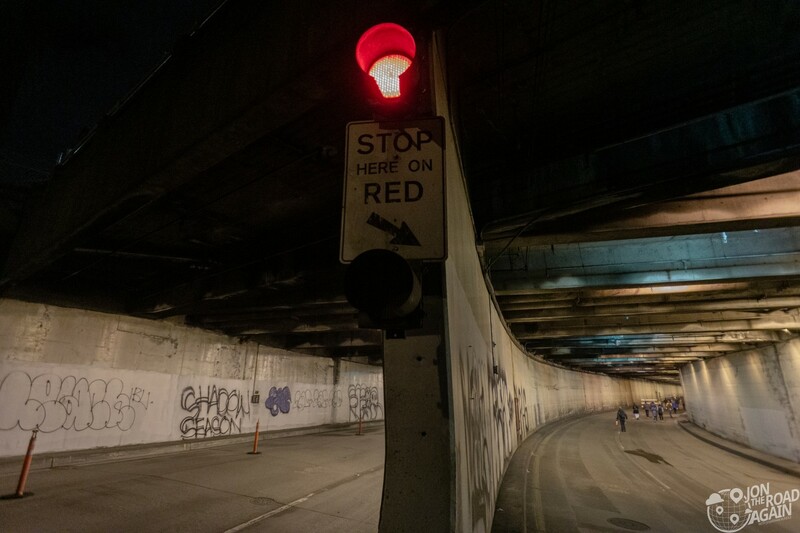 Continuing the nostalgia tour for something most considered a horrible blight on the city, today we’re our chance for the last Seattle Viaduct walk. 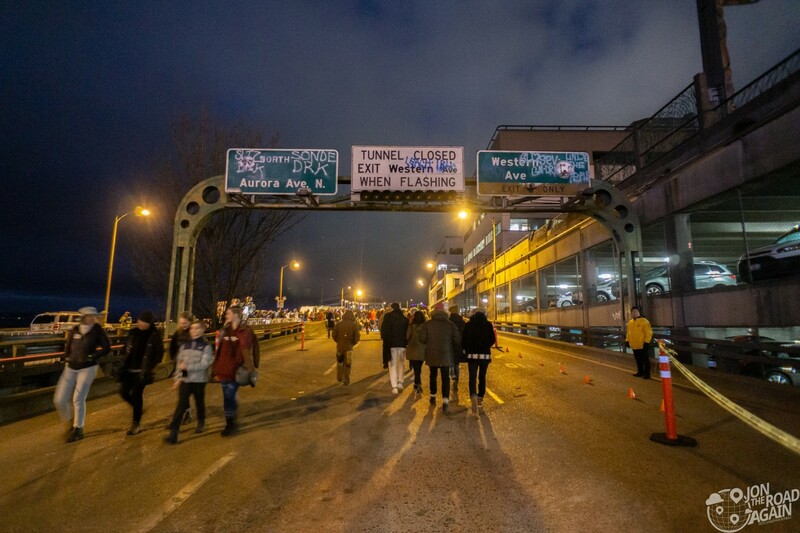 The Alaskan Way Viaduct, built in 1959, crossed the full length of the city from SoDo and Pioneer Square in the south through Belltown to the north. 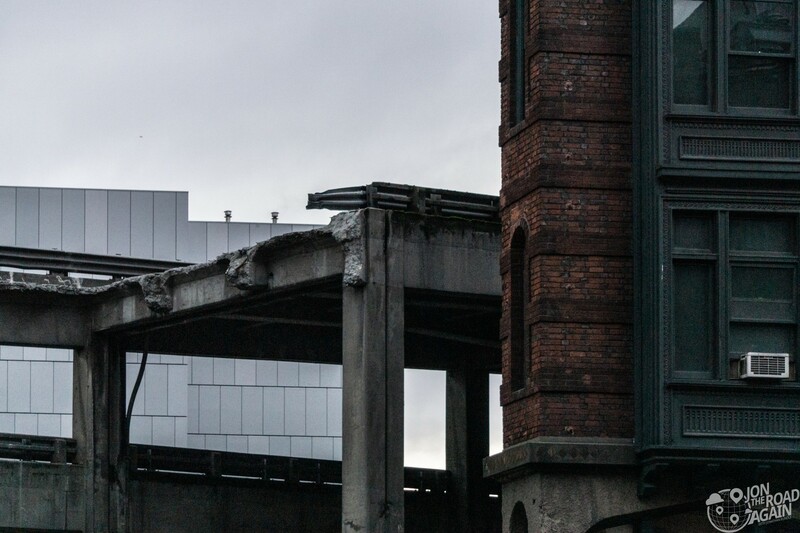 The demolition has already begun in some areas and will kick up with vigor in the coming weeks and months. 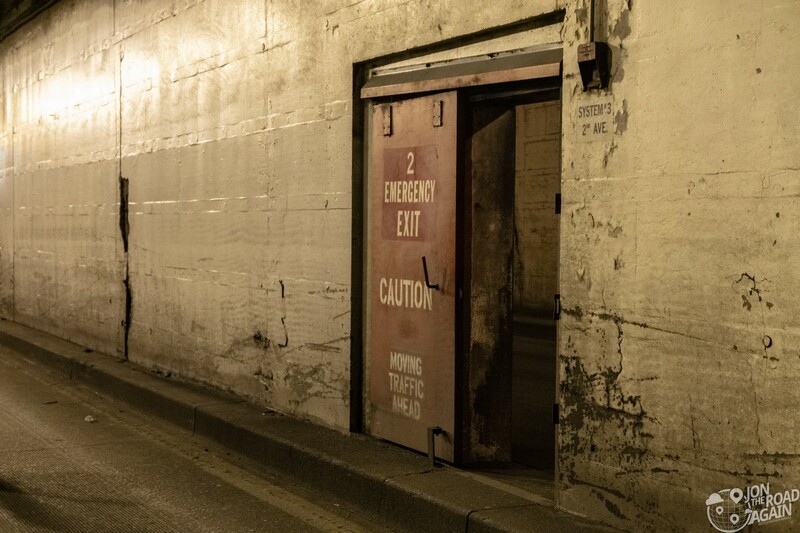 Today’s events, which also included the new Seattle Tunnel walk, are the last hurrah for this old structure and an introduction to the new engineering marvel of the day. 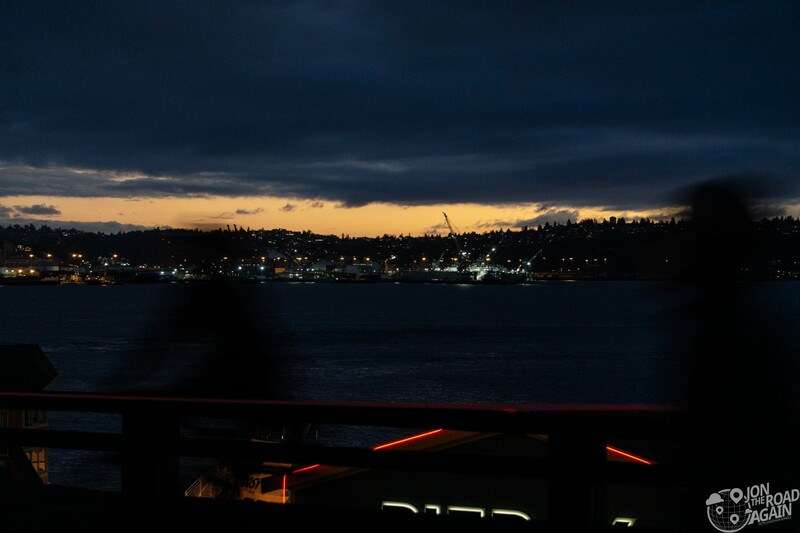 Last time on the blog, some friends and I took our motorcycles for the last ride on the Seattle Viaduct before it was closed to vehicular traffic. 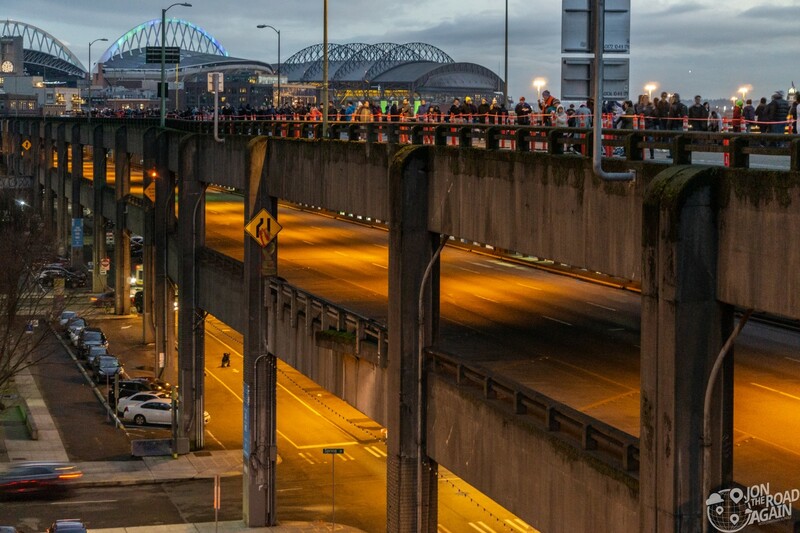 Check out that post to get an additional fix of life with the Viaduct. 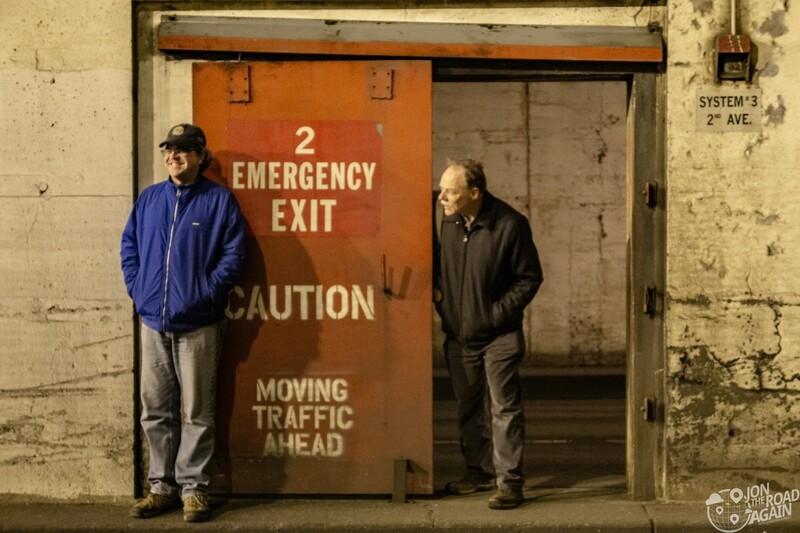 Today we walked onto the viaduct by way of the Seneca Street off-ramp. 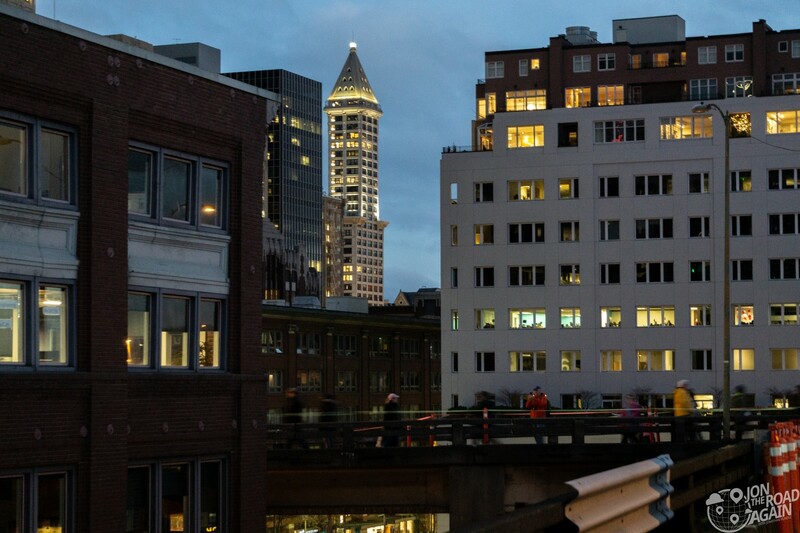 After spending most of our day walking through the new SR-99 tunnel, we finally made it to the viaduct just after sunset. So many loved the viaduct not just because it was the shortest route between the south and the north. 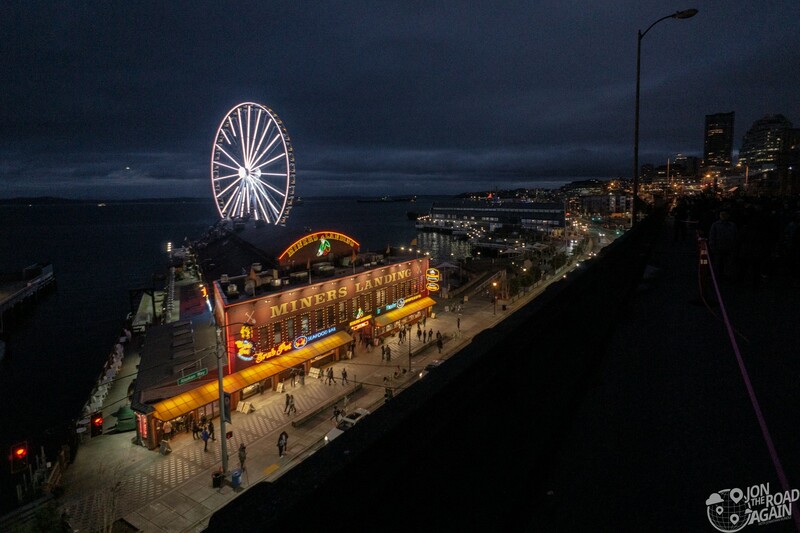 Its two miles on the upper road deck offered an amazing waterfront view of Elliot Bay. 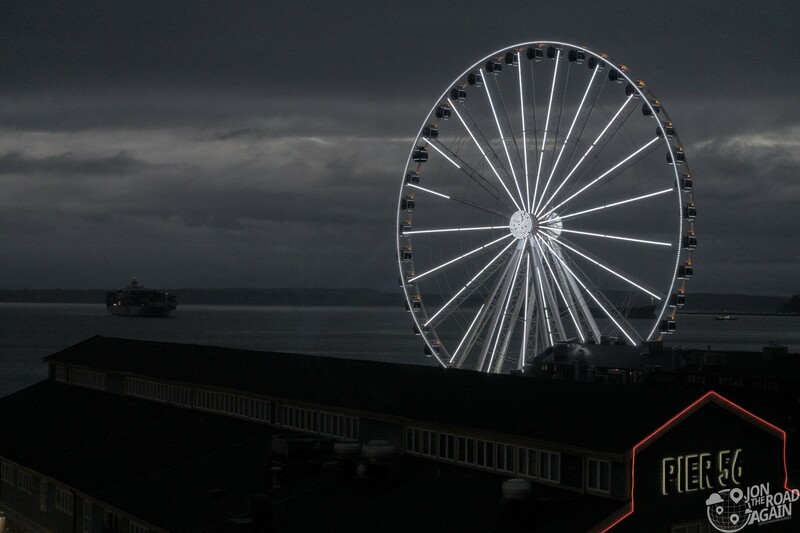 One of the more recent favorites to see from the viaduct is the Great Seattle Wheel. There is no shortage of photos of it on Instagram, that’s for sure. 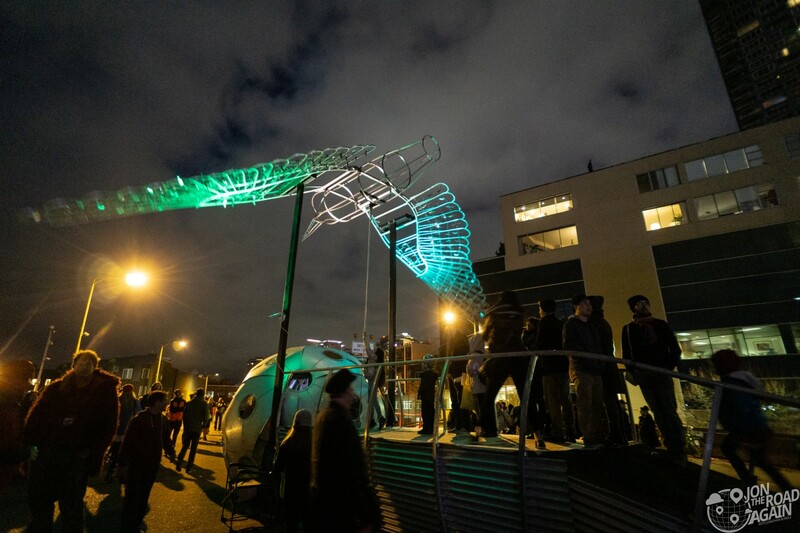 Today and into the night, the upper deck was transformed into a celebration. 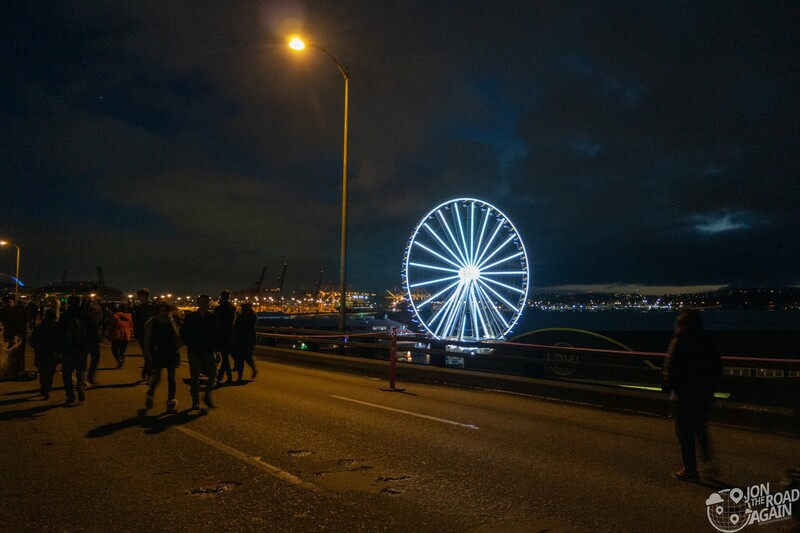 Photographers set up tripods, bands performed, marching bands played and walked the length of the structure and artists built installations for mourners to play with. The structure used to move over 100,000 cars per day. Today, it’s sure to host that many or more who wanted to say goodbye in person and on foot. 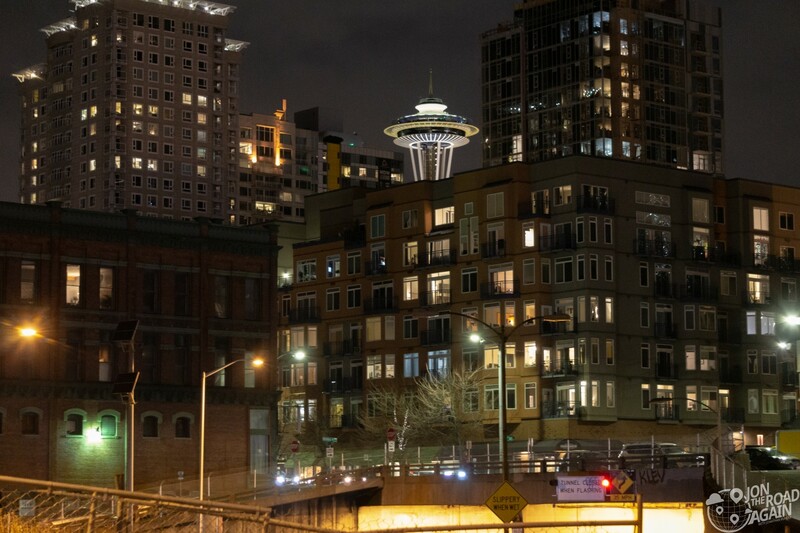 A motorist’s last view before ducking into the Battery Street Tunnel was of the Space Needle. It’s glowing brightly tonight, as usual. 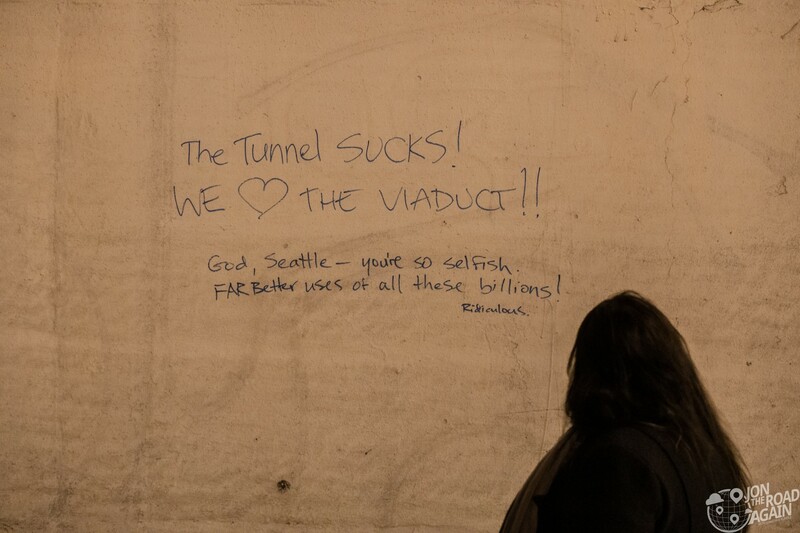 While the citizenry has shown the viaduct a lot of love in it’s numbered days, virtually none of that extends to the Battery Street Tunnel. 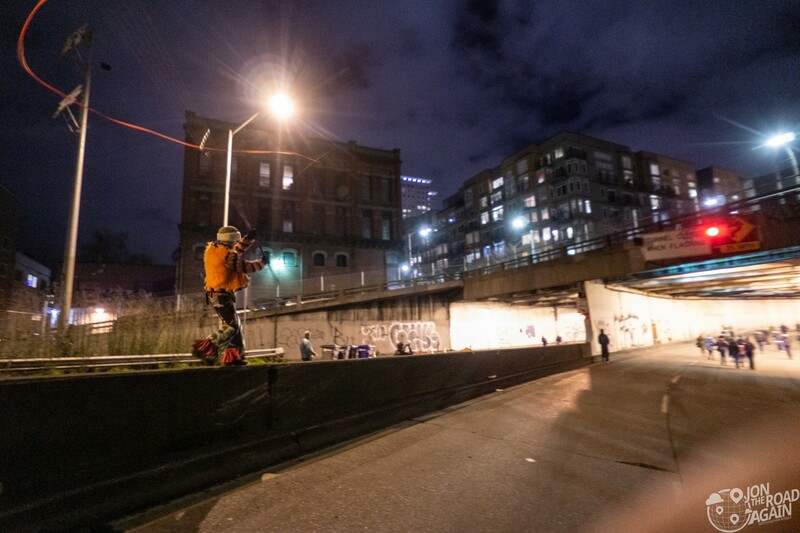 Outside of this energetic ribbon dancer/jersey barrier tightrope walker, a lot of people called it a night at the Western Avenue exit, avoiding the tunnel altogether. 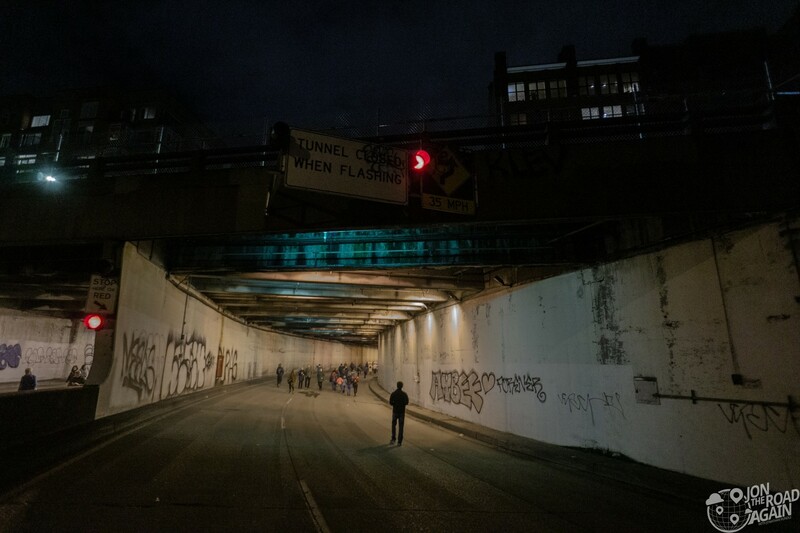 Let’s be thorough; the last Seattle Viaduct walk needs to include a jaunt through the decrepit old tunnel. 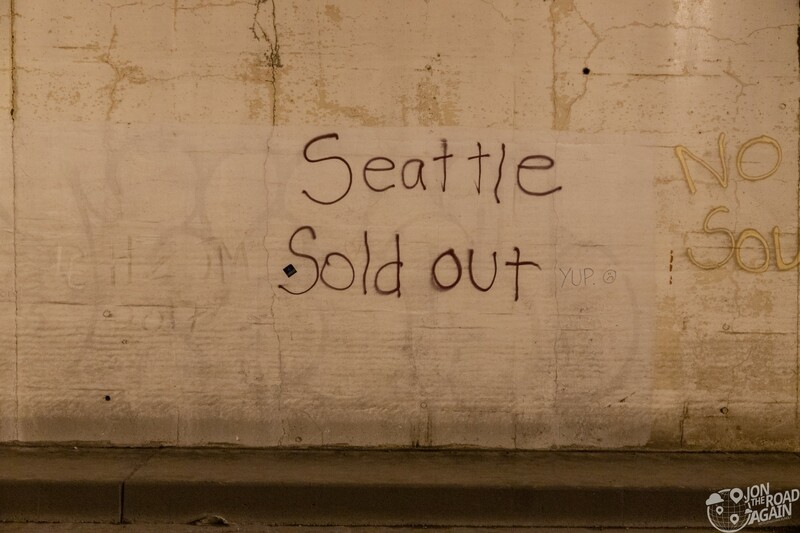 Many have left their mark on the walls during today’s event. 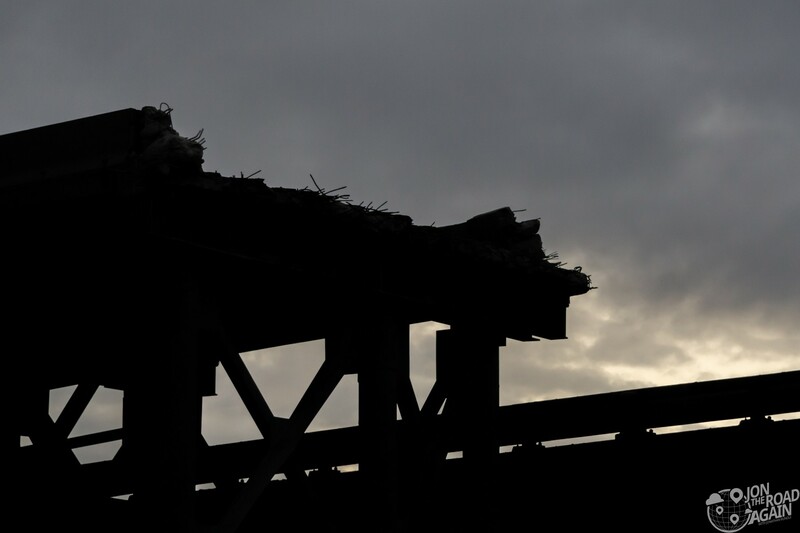 These memories will be forever sealed with rubble from the viaduct, never to be seen again. 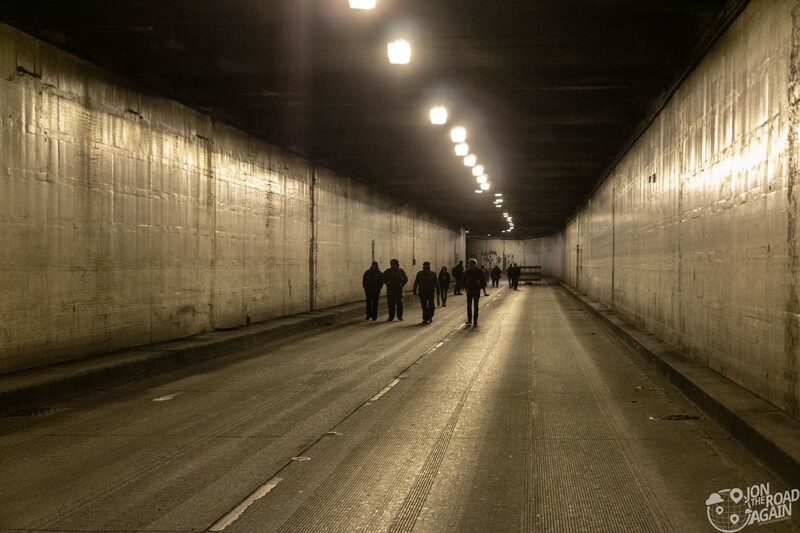 The tunnel is a mess. It’s dirty as hell, the walls are pockmarked and gashed with years of scrapes from fenders and rear view mirrors. 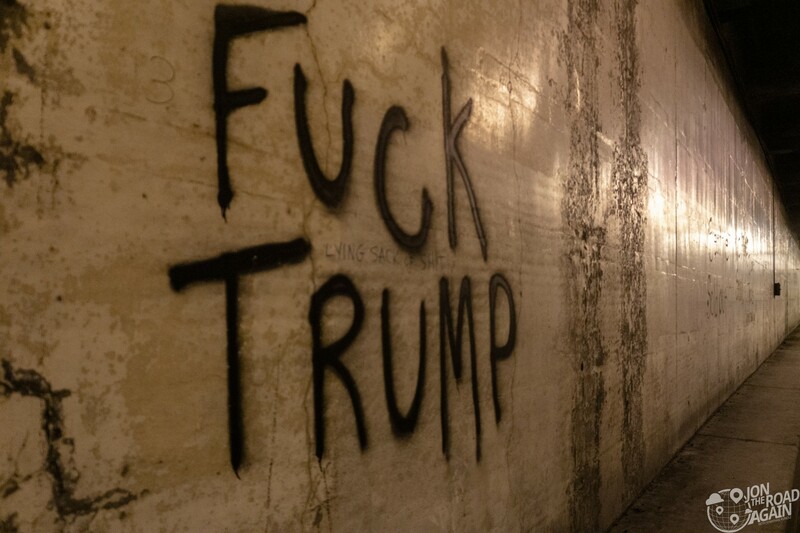 The tunnel is a mess. It’s dirty, the walls are pockmarked and gashed with years of scrapes from fenders and tires and rear view mirrors. 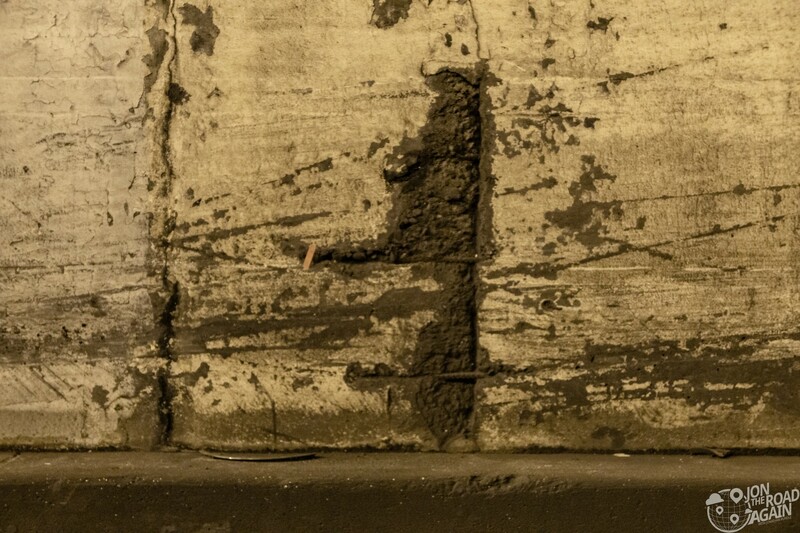 Water from 1st avenue has eroded and stained sections from top to bottom. It is very unlike the pristine new tunnel we only just left a few hours ago. Having walked through the tunnel, I take one last look at the north portal, soon to be sealed forever. 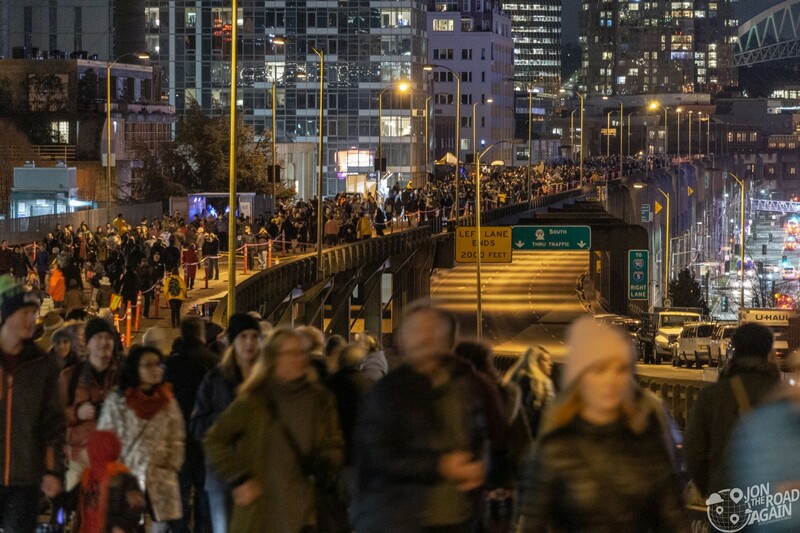 As you know, the opportunity for a Seattle Viaduct Walk has passed. 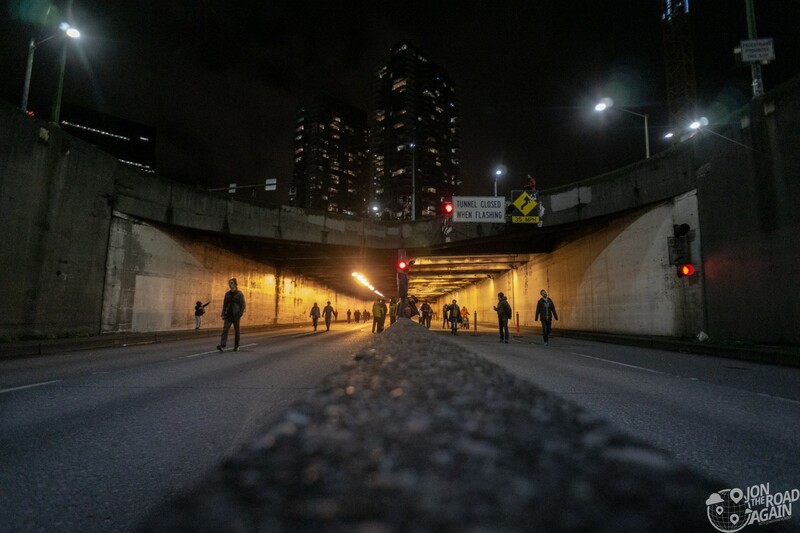 But, there’s always a chance to experience the new SR-99 Tunnel, so there’s that! 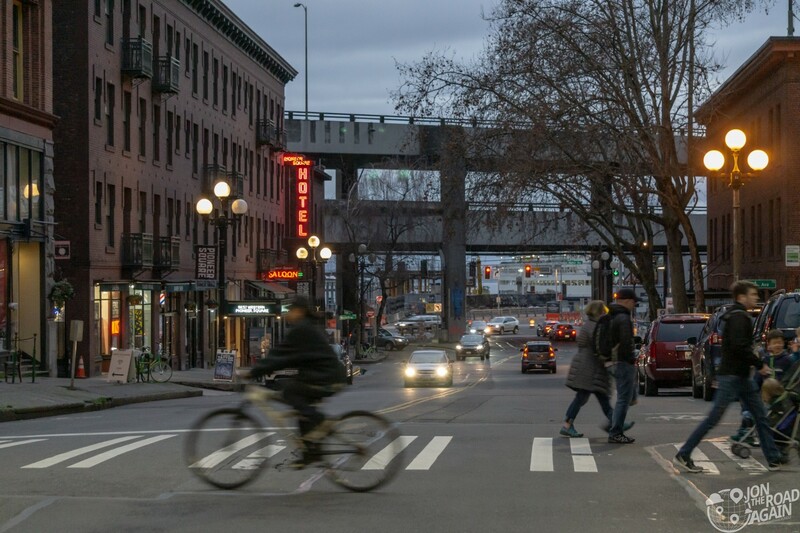 Hopefully, it can serve Seattle for as long and as well as the old Viaduct did.